Three Centuries of American Prints: from the National Gallery of Art, National Gallery of Art, Washington; National Gallery in Prague, Prague 1; Antiguo Colegio de San Ildefonso, Mexico City; Dallas Museum of Art, Dallas, 2016 - 2017, no. 131. Gemini G.E.L. Sequence List. Los Angeles, California: Gemini G.E.L., unpublished, no. 480. Belknap, Dorothy C., and Stephanie Terenzio. 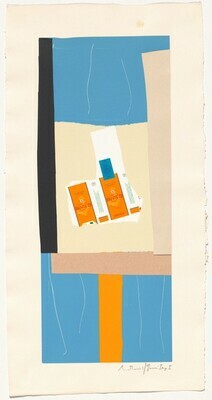 The Painter and the Printer: Robert Motherwell's Graphics, 1943-1980. New York: American Federation of Arts, 1980, no. 127.